Of all the reasons that Aston Villa look certain to be playing in the Championship next season, the most maddening is their unerring ability to tease their supporters with the idea that they are capable of pulling off one of the greatest escapes in Premier League history, only to ruin rare spells of encouragement by pressing the self-destruct button. Ever so briefly, ever so tantalisingly, Rémi Garde�s side had West Ham United on the ropes, and Jordan Ayew will struggle to explain what was going through his head when he jabbed his arm into Aaron Cresswell�s face and forced his team-mates to play for the next 73 minutes a man down. If only Villa had found a more productive way to channel that aggression, their position might not be so perilous. Instead they are bottom, 10 points behind Norwich in 17th place with 14 games to play, and afterwards Garde repeatedly turned down the chance to confirm that he will still be in charge at the end of the season following reports that he is considering his future after a month of inactivity in the transfer market. When the transfer window shut on Monday night, it appeared to be the cue for them to lift the white flag above Villa Park after the failure to make a single signing in January, creating the impression that the people who make the decisions at Villa have already given up, and only three minutes had passed before self-deprecating chants about relegation could be heard from the away end. Villa�s supporters later turned their ire on the club�s unpopular owner, Randy Lerner, and there was further dissent against the board after Cheikhou Kouyaté made it 2-0 in the 85th minute. However, this was less a game of two halves, more two wildly differing contests stuffed into a single 90 minutes. For the first 17 minutes, before Ayew was sent off, Villa outplayed West Ham and they should have had a penalty when Michail Antonio handled Gabriel Agbonlahor�s cross. But once Ayew made his sorry contribution, it was simply a question of waiting for West Ham to score and Bilic praised his side�s professionalism. Victory kept West Ham sixth, a point behind Manchester United. �Like the two previous games we have been denied a penalty, at West Brom and the home game against Leicester,� Garde said, before questioning whether Antonio�s opener in the 58th minute should have been disallowed for offside. All of which only served to heighten the frustration that accompanied Ayew�s moment of inexplicable folly. One second Villa had a throw-in deep on the right, the next Jon Moss was walking over to brandish his red card after Ayew lost his cool during an innocuous tussle with Cresswell, reacting to a shove from the West Ham left-back by flooring him with a forearm smash to his face. It was an act of pure selfishness from Ayew, a remarkably stupid way for Villa to relinquish their dominance. 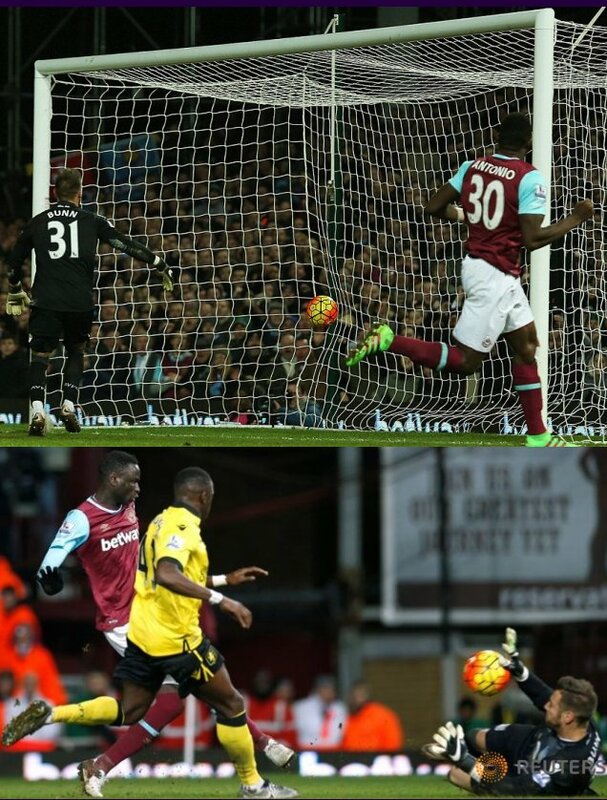 �Until the red card, they were there, confident,� Bilic said. Having started slowly, it took West Ham a while to adjust. Yet it was defence against attack after the break, West Ham increasing the tempo, Villa barely daring to cross the halfway line, Agbonlahor foraging fruitlessly on his own up front. Ineffective in the first half, Dimitri Payet�s influence grew and for all their resistance, it was only a matter of time before Villa cracked. Antonio, Mark Noble and Payet all went close before a curious piece of goalkeeping from Mark Bunn led to West Ham�s breakthrough. Although it was an excellent searching pass from Noble that caught out Aly Cissokho, who was out of position as the ball sailed over his head, Antonio still had a lot to do from a tight angle on the right of the Villa area. Yet even though it was a cleverly improvised header from Antonio, Bunn seemed to think that it was going wide and hardly reacted at all, almost watching the ball spin into the far corner. Bunn�s error was Villa�s season in a nutshell and just when they were pushing for a late equaliser, West Ham broke and Kouyaté finished calmly after fine work from Enner Valencia.